The perfect Halloween recipe, pumpkin soup is a great winter warmer and you can find a good pumpkin for about one pound at this time of year. The perfect Halloween recipe, pumpkin soup is a great winter warmer and you can find a good pumpkin for about one pound at this time of year. There's no excuse, so get cooking! Cut off the top of your pumpkin and scoop out the seeds and insides and discard them. Carefully hollow out the pumpkin, removing the flesh by using a sharp knife and a spoon. Roughly chop the scooped-out pumkin flesh. Start to melt the butter on a low heat in a large pan. Add the onions and cook gently for 10 to 15 minutes, until they are soft and golden. Add the chopped up pumpkin to the pan, add the cinnamon and nutmeg and season to taste with salt and pepper. Turn up the heat to medium and put on the pan lid. Cook for 40 to 45 minutes, stirring occasionally, until the pumpkin is cooked. Add the chicken or vegetable stock and bring back to the boil. Remove from the heat and let the soup cool slightly. Transfer to a food processor and blend until smooth. Return the soup to the large pan, simmer and cook for a further 30 minutes. Stir in the sherry prior to serving. Preheat your oven to 170 C/335 F/ Gas Mark 3. Pour the soup into the hollowed-out pumpkin shell, add the sherry and stir. Place the the pumpkin's lid onto the pumpkin and place the whole thing on a large baking tray. Cook for around 45 minutes, bringing the soup up to temperature. 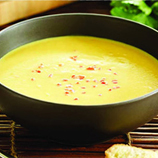 Serve the soup in the pumpkin at the table, ladelling into individual bowls. If you plan to serve your pumpkin soup out of the pumpkin, as instructed above, ensure that you leave 2cm of flesh all around the inside when hollowing out and take care not to pierce the skin.